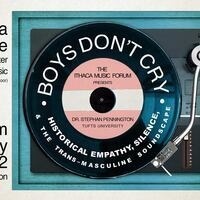 The Ithaca Music Forum presents BOYS DON'T CRY: Historical Empathy, Silence, and the Trans-Masculine Soundscape, a talk by Dr. Stephan Pennington of Tufts University. Individuals who would like to request accessibility accommodations should contact drifkin@ithaca.edu. We ask that requests be made as soon as possible to ensure they can be met.